It may be used in the production of ropes, but jute is also commonly encountered across a range of other natural fibre products, such as sacking and cloth. Our jute ropes are versatile and varied, since this material works well when combined with other fibres to enhance its capabilities beyond what you might expect. 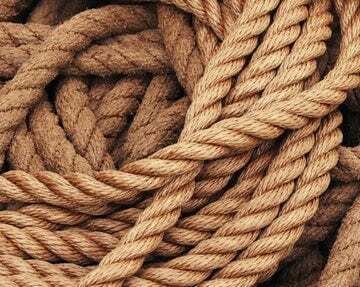 Jute rope is most commonly used as twines and cordage in small diameters. The larger diameters are used for boating, towing and stair ropes. Jute is actually sourced from vegetables and is encountered in everything from ropes to hessian sacks. Its key benefit when compared with the likes of sisal rope and manila rope is that it is a little more flexible. This is also why it is also found in twine and cords, creating a rougher finish than something like cotton might offer. Its aesthetic qualities might suffer slightly because of this finish, but for applications where looks are less important than reliability, it will be ideal. In terms of eco-friendliness, jute rope is definitely at the top of the class. It can completely degrade if it is not blended with anything else, so disposing of it without damaging the environment is easy. Of course this means that it is not as resilient as nylon rope, which is worth bearing in mind. There is no need to stand on ceremony if you have a question about the natural fibre ropes we produce at Rope Service Direct. You can reach our expert team with a quick call to 01384 78004, or via our email page, to get the answers you need. Jute Rope Overall rating: 5 out of 5 based on 6 reviews.